After the camp flood on 12 February, things came back to normal fairly quickly, and the work of the Expedition continued. 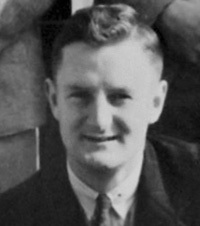 Several advance working camps were set up, with the one at Leslie Clearing at about 3000 feet being supplied by airdrops from “Popeye” Lucas’s Aircraft Company based in Queenstown. Supplies were packed into sugar sacks with a small parachute attached and dropped over the side of the aircraft. Leslie Clearing was really an alpine bog and a proportion of the supplies ended up in it and were not able to be recovered. 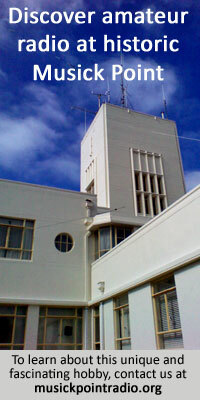 Contact was kept with the Aerodrome Base Radio ZLBC at Queenstown, and with Leslie Clearing ZLKC2 during the air dropping operation and four drops were made. The Upper Stillwater Camp ZLKC3 was also supplied by air in the same way, with 900 lbs of supplies being dropped. On the day of the Leslie Clearing drop, Piet Van Asch of the Hastings-based Aerial Mapping Company was in the air making the most of the clear conditions. I had the pleasure of an air-to-ground chat with him when he was making a run over Caswell Sound. Contact was also maintained with the supply vessel Alert ZMRS on the small ships frequency of 2162/2182 k/cs, with signals being consistent on the Milford Sound-Caswell Sound run. Attempts were made to contact Puysegur Point Lighthouse ZMU on this frequency, about 90 miles south, as their weather reports would have been useful, but their signals were too weak and attempts were abandoned. Milford Sound Radio ZMV was an essential back-up station as the Alert was moored there for periods. Signals were consistent on the 180 mile radio path southeast to Awarua Radio ZLB, and no problems were encountered in working CW on 4280 k/cs. The expedition was initiated by the desire to study the Wapiti, so some information about the animal needs to be included. It is a large noble beast with the bulls (stags) having a good spread of antlers, generally considered to be too large and heavy for the rough type of country they were in. A number of Wapiti carcasses were found where they had got entangled in heavy bush, or had slipped and fallen to their deaths. Red deer were in the same area as the wapiti, and there was the eternal question as to whether the two species were cross-breeding or hybridising. This was biologically feasible as the two species are closely related, but there is a difference in the animal’s calls: the red deer has a bark or “roar”, while the Wapiti has a two note call or “bugle”. The result of any cross-breeding on the animal’s “voice” would be interesting indeed! To study the animals in detail the deer that were shot were skinned with the head skin, hooves and tail left attached to the hides. The carcass was weighed by cutting into parts on the spot and weighing separately. The hide, stomach contents and skull were then packed down to the Base Camp where the Preparator from the Dominion Museum attended to them. The skulls were boiled to remove the flesh, then packed in moss and sent to Wellington for detailed examination, before being forwarded to Dr Murle in the United States. The skins were cleaned and salted since it was impractical to dry them in the prevailing climate. Over the five months of the expedition a total of 45 animals were shot, and the specimens brought back for treatment. The two shooters from the Department of Internal Affairs on this work earned my admiration. Not only were they well laden when they set out with pack, rifle and ammunition in wet heavy bush, but even more heavily laden struggling back with the hides and skulls. Surprisingly, they seemed to enjoy it! Estimations of the number of wapiti in the park varied, but it was generally considered at that time (1949) that there were about 500 in the whole area. There were few accidents, and just as well, as it was a long journey to the nearest hospital. One person found on arrival that he was allergic to beech trees, and came out with the “birch itch” which he had to stick with until he could get out on the next trip. Two others came in ahead of the law, but its long arm reached out via the radio and returned them on the next vessel. The camp cook went out on the same trip, as his food and hygiene was well below an acceptable standard, and a potential risk to all. The only real casualty occurred when Ken Miers cut his hand badly with a slasher while up on the “tops”. It took half a day for him to walk down to the Base Camp where an unsuccessful attempt was made to suture the cut. It was Saturday and fortunately I was able to break into Milford Sound’s last schedule of the day with Awarua Radio and request assistance. The Alert, which was berthed at Milford Sound, left for Caswell Sound that evening in readiness for a return to Milford in the morning. The patient and the Medical Sergeant, Max Farrell, left the Base Camp at daybreak and boarded the Alert which sailed back in heavy weather to arrive at 3pm. They then travelled by truck to Gore Hospital arriving late that night. A few days later we got news on the 80-metre band from ZLHR that Ken was making a good recovery and that no permanent damage had been done. I kept in touch with the “Hams” at Awarua Radio using my own callsign ZL4JF and had the pleasure of receiving a “Happy Birthday” call from ZL4FP and chorus. It was good to have these calls, and to realise that you were not so far away. The report on the area, published in 1951 by DSIR, Bulletin 103, makes interesting reading. When the expedition was originally planned, the State Hydro-electric Department asked the Land and Survey Department to compile accurate topographical information of the area covered by the expedition. Investigations were to be made into the hydro-electric power potential represented by the proximity of Lake Te Anau to, and its elevation above, the West Coast Sounds. The direct line distance from the southwest arm of the Middle Fiord of Lake Te Anau to Caswell Sound would be about 10 miles, at an elevation of 673 feet. The Aerial Mapping Company had already commenced its photographic runs over the area in November 1948 and finished in March 1949, after considerable difficulty in getting clear weather for their work. The four-man ground survey party had the hard task of setting up survey stations on the peaks, but a good number were set up before continual heavy snowfalls on the tops halted this work in mid-April. The geological party of two men working in the area generally confirmed the views of earlier exploration that there were no economically important mineral deposits. There was evidence that mica could be present in moderate quantities, and indeed it was formerly mined near the Henry Saddle, between George Sound and the northwest arm of Lake Te Anau’s Middle Fiord. The Forest Survey party found that the Fiordland forests had no immediate or potential value for timber production. Two species of timber-producing trees were present—silver beech and rimu – and in both species timber quality is excessively poor. The forests also have no real value in the conservation of soil or water, as they are perpetually saturated and have little effect in controlling run-off. Although the mountains around Caswell Sound are a good deal lower than Milford Sound, 4000-5000 feet against 6000-9000 feet, the amount of rainfall seems to be about the same. Half of all the days that the expedition spent in the Sound were wet, with the first snow occurring on the tops on 22 March, and thereafter creeping down to 500-1000 feet in mid-April. There were occasional thunderstorms, but surprisingly little wind. March was a busy month, with parties of scientists coming in regularly, together with other interested persons. A reporter from a Dunedin newspaper came in, and after he had a look around, began to send out press messages. These were no problem to handle at the Base Camp, but one was lodged on the Alert on its way back to Milford Sound. 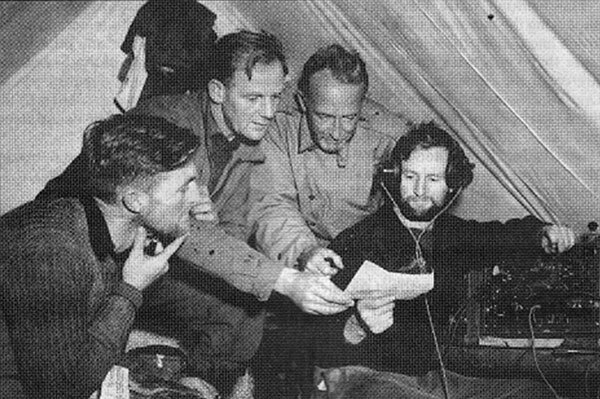 Fortunately, Max Farrell was aboard and he was able to key it back to Base Camp where it was retransmitted to Awarua Radio. 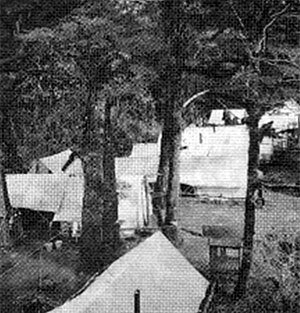 About mid-April the work at the advance camps in the Stillwater area had been completed, and all the tents and gear were dismantled and moved back to the Base. 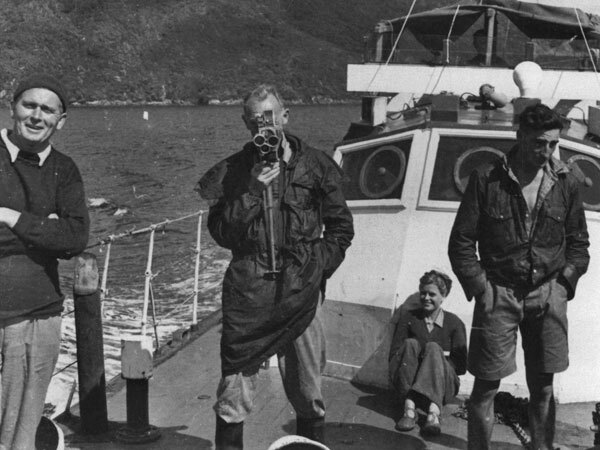 Operations were now centred in George Sound where a camp had already been set up. The radio was set up in the Park Board George Sound Hut which was already there. This was heaven indeed, as the hut was on the water’s edge and you could see out over the fairly extensive waters of the Sound, and directly up at the sky, instead of through the heavy, somewhat oppressive bush as at Caswell. The next day was spent putting up an aerial leading into the hut, but a few days later it was blown down by a high wind, something that was never experienced at Caswell. The expedition was now in its closing stages with all the gear being dismantled and packed for transport. There was only one out-station ZLKC2 at Caswell Sound Beach, and little traffic to or from Awarua Radio, so I had time to enjoy exploring the area. I was able to get up to Lake Katherine on the route to the Henry Saddle, and to cross the lake in a rubber boat which had been left there. On another day I was landed at the southwest arm and got up the track almost to the Ethne Saddle leading over to Caswell Sound. On returning from Lake Alice on the outlet of the Edith River I almost ran into a Wapiti stag and two hinds quietly browsing near the Sound’s edge. They took off very quickly but I was close enough to see what magnificent animals they were. There was good fishing in George Sound and quite a few Blue Cod and Groper were caught, making a welcome change to the menu. On 7 May all the tents and crates were loaded on the Alert in heavy rain, and the launch left for Caswell Sound where the remaining gear was picked up the next day, the launch then sailed for Milford Sound. Most of the remaining service personnel went out on this trip, and the few that were left commenced assembling a prefabricated hut, brought in for the Fiordland National Park Board. There was little radio activity now — just to keep in touch with Awarua Radio and the Alert — so I helped out with the hut assembling, and crated the radio sets for shipment. I had time to listen on 80 metres and worked ZL3MX of Timaru, ZL4GH of Awarua, and also ZL4DE and ZL4CY. On Friday 13 May, a fine cold day, the hut was completed and the Alert arrived late in the afternoon. Caswell Sound Radio ZLKC now closed for good on the final schedule with Awarua Radio. Contact with ZLB would now be kept on the Alert’s radio until berthed at Bluff. On Saturday with all the remaining stores loaded, the vessel sailed at noon. Coming down the Fiordland coast in fine weather and a good sea, was a thoroughly enjoyable experience. I stayed up on deck until dark watching the bush-clad coastline slide by, only going below for dinner when sailing behind Secretary Island in Doubtful Sound. The launch anchored for the night in Breaksea Sound. Sunday was another fine day, and we sailed via the Acheron passage to Puysegur Point where the launch anchored, with everyone going ashore for a while. It was pleasant to stretch your legs on the farm-like country around the lighthouse, and to have a look through it. This most westerly light and strategic weather station will now have been automated, and I just wonder if the farmland is still there. Some of the Puysegur people came aboard and the launch moved up the inlet to visit the legendary Jules Berg, the “hermit” of Puysegur Point. It is pleasing to hear that an isolated adventure lodge, “Kisbee Lodge”, is nearing completion on the ghost town site of Cromarty. It is hard to visualise now that Cromarty was once a bustling gold mining town of 500 to 1000 people. The Alert sailed at 8pm, on a clear calm night, and arrived at Bluff at 5am, concluding my association with the New Zealand-American Fiordland Expedition and the Caswell Sound temporary radio-telegraph office ZLKC. The radio sets were on loan from the Army and they had asked for a report on their suitability for the country they were working in. Full marks went to the ZC1s which were entirely suited to the conditions, and gave a faultless performance, both on CW and Phone. These are extremely well engineered sets, and I can quite see why they are still around. Unfortunately, the 48 sets were not suited to the conditions at all, although the best possible use was made of them.